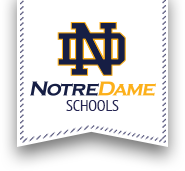 The Montessori Pre-K at Notre Dame Elementary School is a multi-age classroom of three, four and five year olds that follow the educational principles of Maria Montessori. The children are encouraged to develop independence in a prepared environment. The classroom is purposely designed to create an atmosphere for learning where children are free to learn at their own pace. The teacher and assistant work one on one in small group instruction. Religion, language arts, science, math and geography are part of the curriculum. Children must be 3 years old by September 1st, 2018 and have independent bathroom habits. The program is available for half-day session (8:00-11:00) or full day (8:00-2:25.) Both sessions run Monday through Friday. The Aftercare Program is available until 5:30 PM at a separate cost from the tuition. Half-day tuition is $3,981.00; full day is $5,136.00. A monthly payment plan is available.